Manchester United will in a year from now go for Celtic defender Kieran Tierney, according to Mirror Football. Former Manchester United star Patrice Evra has sealed his return to the Premier League with West Ham United. The 36-year-old has joined the Hammers on a short-term contract until the end of the season. West Ham United are looking into a surprise move to sign former Manchester United left-back Patrice Evra this month. The Frenchman is a free-agent after he was released by Marseille due to disciplinary reasons. Former Manchester United Patrice Evra is reportedly against a potential move back to England following his release from Marseille earlier in the season. French club Marseille are looking to add a couple of experienced faces to their squad with a move for former Arsenal and Manchester City defender Bacary Sagna. Manchester United have reportedly rewarded midfielder Michael Carrick with a year's extension following his impressive showing during the 2016/17 season. French club Marseille will seek to secure the services of Leicester City's Riyad Mahrez when the transfer reopens in the summer. Arsenal standing captain Laurent Koscielny has been linked with a surprise move away from the Emirates in the summer. 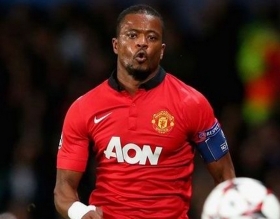 Former Manchester United full-back Patrice Evra has admitted that he was close to a winter return to Old Trafford. The France international eventually opted to join Marseille on a free after he was denied from making his comeback. Former Manchester United full-back Patrice Evra has reportedly joined Marseille on a free transfer from Juventus. Juventus full-back Patrice Evra is expected to make a decision in the next 24 hours amid interest from the likes of Marseille, Crystal Palace, Lyon and Valencia. Crystal Palace manager Sam Allardyce has confirmed that his side have finalized a transfer fee to sign Arsenal's Carl Jenkinson this month. Juventus manager Massimiliano Allegri has revealed that experienced full-back Patrice Evra has yet to decide on his next move. The former Manchester United ace has been linked with a potential switch to Crystal Palace this month. Manchester United boss Jose Mourinho has for now stalled over a move for Benfica defender Victor Lindelof, BBC Sport claims. La Liga strugglers Valencia are apparently in the running to sign Juventus full-back Patrice Evra this month. France international Patrice Evra has made contact with both Manchester United and West Ham United as he bids to return to the Premier League this month. West Ham United boss Slaven Bilic has insisted that his side are not in the running to sign former Manchester United full-back Patrice Evra. Bacary Sagna to quit Manchester City for Italy? French right back Bacary Sagna wants to make a move away from the Premier League and has indicated that Italy would be his preferred next destination. Sagna joined Man City from Arsenal two years ago.